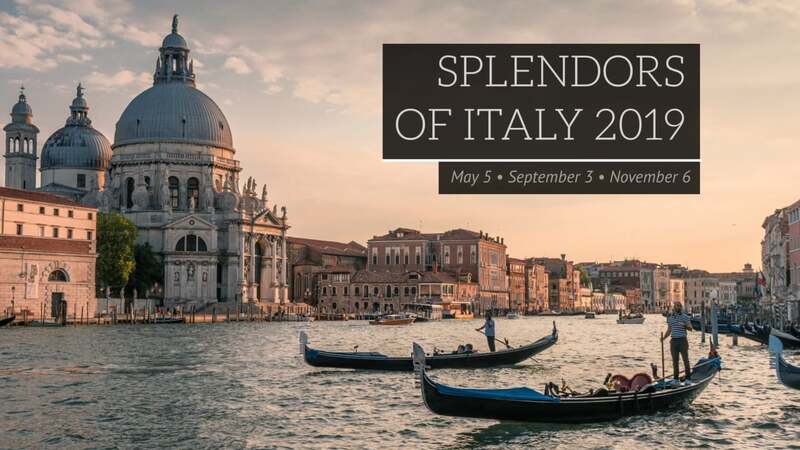 Join us on this 10 day Splendors of Italy tour!! Prices starts at $3,598* from New York. Your Italian adventure begins as you depart on your international flight. Our representatives will meet you at the airport in Milan. Begin your time in Italy with a stop overlooking Lake Garda, Italys largest lake. Continue on to Verona, home to Roman ruins and a courtyard that is reminiscent of Shakespeares Romeo and Juliet, whose story was set in Verona. Finish the day at your hotel for dinner and overnight. Travel by boat to the magical city of Venice. Rising between sea and sky, this fascinating city boasts waterways and boats instead of roads and cars, encompassing 118 islands separated by more than 150 canals. Stand in the Piazza San Marco, bordered on three sides by palatial arcades in two tiers and faced on the other by the Basilica of St. Mark, one of the worlds most magnificent churches. Tour the Basilica with its treasure of marble and gold-background mosaics. From the square, you can see the famous Bell Tower and the Clock Tower, as well as the charming pink and white Doges Palace. After seeing the romantic Bridge of Sighs, enjoy free time to explore on your own. You can shop, stroll along the bridges and canals or even indulge in a gondola ride along the Grand Canal. Dinner and overnight in Venice area. Travel to Pisa and snap your photo in front of the famous Leaning Tower. This 180- foot-tall round tower is over 10 degrees out of perpendicular. Originally designed to stand straight, it began to lean during its construction in 1173 and corrective efforts failed. Even without its tilt, the building would still be one of the most remarkable bell towers in Europe and one of several renowned buildings in the center of Pisa. Wander the medieval walled city of Lucca, the birthplace of Puccini. Each of the walls is lined with a different species of tree, and together they encompass a town full of medieval churches. Check into your area hotel for dinner and overnight. The elegant city of Florence is nestled between a line of hills and the banks of the Arno River. During your stay, enjoy the beautiful gardens and a leisurely stroll through the open-air markets. Every street, square and winding alley of Florence is a showcase for Romanesque, Gothic and Renaissance grandeur. 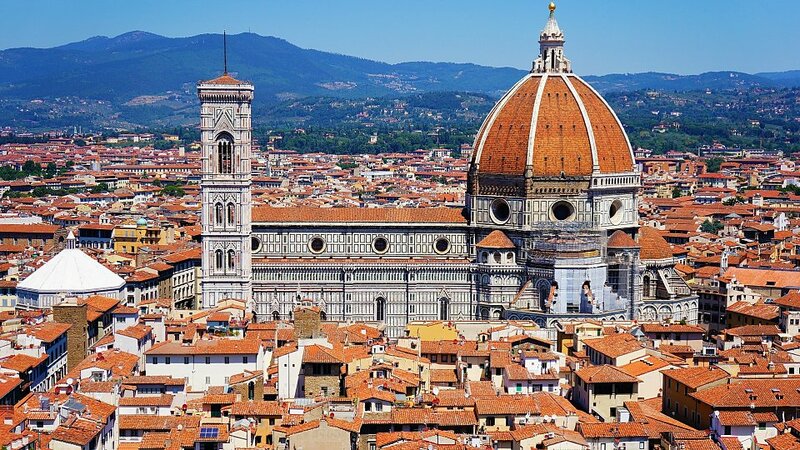 Among Florences masterpieces, youll see the Piazza della Signoria with its Neptune Fountain and Vecchio Palace, the Santa Maria del Fiore Cathedral which houses Michelangelos unfinished Pietá, the Baptistry which features Ghibertis famous Gates of Paradise, and the Academy where you can view some of Michelangelos finished and unfinished work, including the awe-inspiring David. 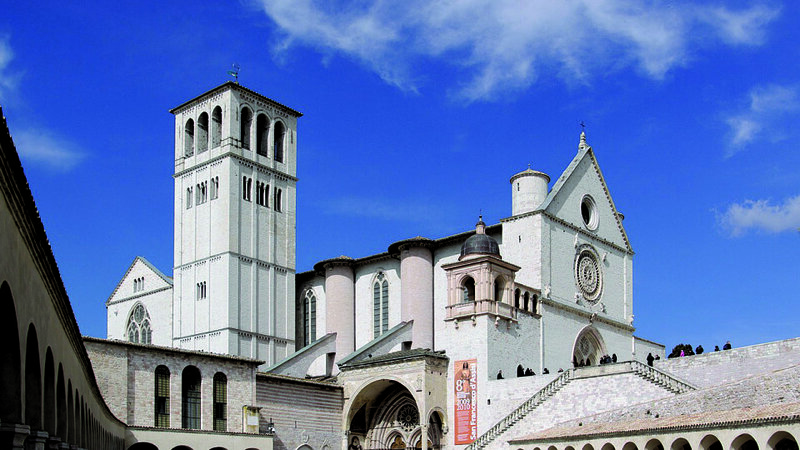 Your journey continues as you travel to Assisi, the charming medieval town once home to Saint Francis. Just two years after his death, the large Basilica was started in his memory. At one time, the land on which the church stands was an execution ground for condemned criminals. In his humility, Saint Francis asked to be buried there, and it became known as the Hill of Paradise. The church contains his tomb and many great works of art. Overnight in Rome area. History is woven through the streets and neighborhoods of Rome as in no other city. 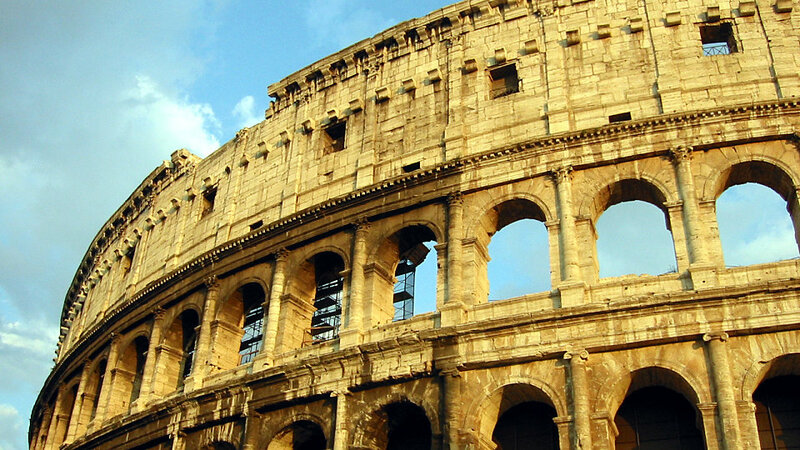 Explore the many wonders of ancient Rome as you visit the magnificent Colosseum and the Pantheon. From the most sacred hill of ancient Rome, Campidoglio, view the Forum. See the Circus Maximus, Arch of Titus, famous Baths of Caracalla and Arch of Constantine as well as the Victor Emanuel Monument and the Monti Region, Romes most ancient neighborhood which spreads over three of her seven hills. In the afternoon, discover why Rome is also known as the City of Love. Explore the romance of Rome as you climb the graceful Spanish Steps and stop at the famous Trevi Fountain. Legend says those who toss a coin into the fountain will one day return to Rome to toss another into the waters of Trevi. Christianity came late in Romes long history, conquering and changing the city in a way few other invaders have. Experience the glory of Christian Rome today as you visit the Vatican, home to one of the greatest museums in the world. And, of course, tour St. Peters Basilica and the Sistine Chapel with Michelangelos frescoes, now restored to their full, colorful glory. Tour the Catacombs of St. Sebastino. The catacombs contain some of the only surviving examples of early Christian art. In the 1840s, Pope Gregory XVI took steps to preserve the catacombs and their treasures. Day 10 Return to the USA or enjoy the Amalfi Coast Extension. Return to the USA or enjoy the Amalfi Coast Extension. Travel to Castel Gandolfo, the Pope’s summer residence. The Romans also preferred this area in the summer to get out of the heat. Enjoy the incredible beauty of this region as your bus travels to Sorrento. You will be in awe of the dramatic cliff top drive that leads to your hotel. During your three night stay, you’ll have time to discover the colorful ambiance of this delightful town and enjoy the view of Mt. Vesuvius. The Amalfi Coast is considered to be one of Italy’s finest! You will be enchanted by the rich hues of the blue green sea, the tiny mystical islands and the pastel colored cottages gathered round tiny harbors! Have your camera ready to capture one breathtaking view after another! Snap a photo of the famous village of Positano which has graced a thousand postcards and charmed at least three generations of travelers. Visit the town of Amalfi, a must for every visitor! A glorious maritime republic from the 9th to 12th centuries, the town is also famous as the place where the compass was invented and boasts a splendid Duomo in Arab-Norman style. Time permitting, you’ll stop at the village of Vietri Sul Mar, home of Amalfi Coast ceramic factories which produce the colorful tiles that decorate every church tower in the area. Enjoy a boat ride to the lovely Isle of Capri which has enticed visitors for thousands of years.Today you will have the opportunity to savor it’s beauty and be captivated with the fabulous views and elegant shops. Visit the spectacular ruins in Pompeii which were covered by the eruption of Mount Vesuvius in 79 A.D. The city remained buried and undiscovered until excavation began in 1748. These excavations continue today, providing insight into life during the Roman Empire. Continue to the Rome area for dinner and overnight. Day 14 - Return to the USA with wonderful memories to share!